Human Brain: The Least Understood Thing Yet! Measuring the potential of just one and a half kilogram in weight of this small piece of human mass is an uphill task. 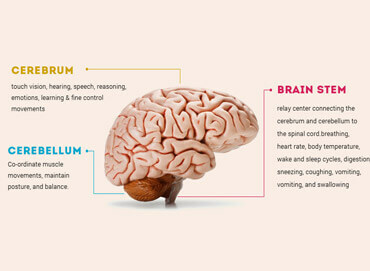 The human brain anatomy explains the immense magical powers it possesses which are still least understood by humans. The miraculous potential of the brain enables us to get an awareness of ourselves and the outside environment. It also gives us a detailed insight about how a human brain processes bulk of sensory data at a higher speed than that of the most advanced computer in the world! The intricate processes, like thinking, imagination, creativity, intelligence and the production of emotions all take place in the grayish matter inside your skull. 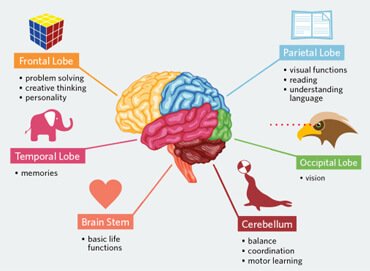 These are called the functions of brain. It is this part of the human body that serves as a control center for every activity in the body. In short, it is the brain that embodies the essence of mind and soul and death of this master organ literally means the death of entire body and the end of life. Divided into different sections, it constitutes the central and superior most part of the central nervous system or CNS. The peripheral nervous system, on the other hand, serves as a complementary part to the CNS as it helps in the collection of sensory data and the transmission of various types of information across various organs. 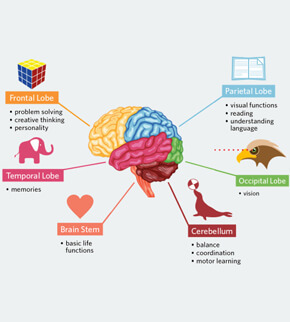 The brain is composed of the complex network of billions of neurons that are arranged in a specific pattern which is vital to the essential functioning of this organ. Working on the principle of division of labour, different parts of brain are specialized for only specific tasks. The entire mass is enclosed inside a hard protective covering, called skull, which is formed by the fusion of eight skull bones along the suture lines. One of the common ways to anatomically divide the brain into various parts is based on its embryonic development. This method divides the brain into the forebrain, midbrain and hindbrain which are also known as prosencephalon, mesencephalon and rhombencephalon, respectively. Another approach favours the division of brain as cerebrum, cerebellum and brainstem. Here follows a brief structural and functional description of different components of this organ. 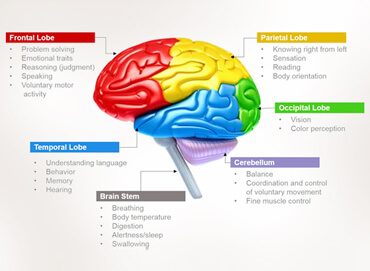 Composed of the right and left hemispheres, it is the largest part of the brain and is responsible for the processing of speech, learning, reasoning, emotions, muscular contractions as well as the interpretation of sensory data related to hearing, vision and touch. 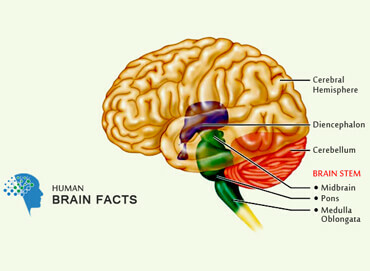 Placed under the cerebrum, it is a relatively smaller component of brain. Cerebellum is assigned the task of controlling and coordinating the movement of muscles, and the maintenance of balance and body posture. Consisting of or divided into three major parts—medulla, pons and midbrain—it serves to develop the connection of spinal cord with the cerebellum and cerebrum. The brainstem is the place from which ten of the twelve cranial nerves originate. This part of the brain also plays an important role in the control of a large number of involuntary processes, including those of breathing, coughing, swallowing, vomiting, sneezing and digestion. Several other automatic functions, like body temperature maintenance, control of heartbeat rate, and the regulation of sleep and wake cycles, etc. It is one of the amazing brain facts that there are around 100 billion neurons or nerve cells in the brain, the majority of which (about 70%) are found in the cerebral cortex. The nerve cell bodies and axons have graying and whitish appearances, respectively. 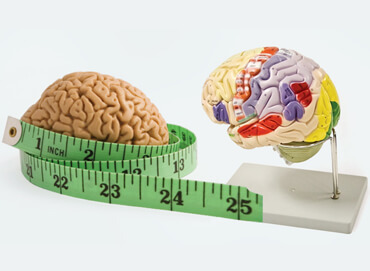 So, the brain can be divided into different parts also on the basis of its physical appearance, i.e. gray matter and white matter. 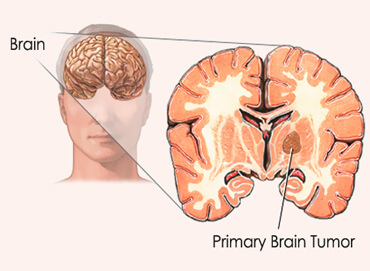 Composed of nerve cell bodies, the cortical region is known as gray matter. Whereas the area beneath cortex is made up of grey colored long connecting fibers (axons) and is called the white matter.